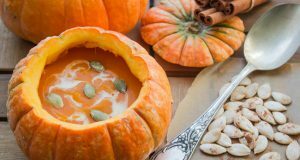 Many diabetics may think they can’t enjoy the delicious fall flavor of pumpkin. 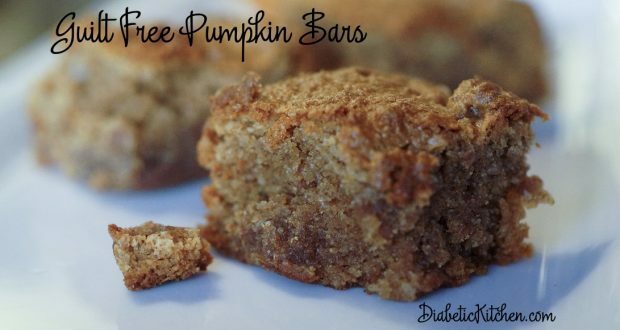 The great news is that pumpkin is actually quite good for your health, and these pumpkin bars are a great way to get your fall-flavor fix! 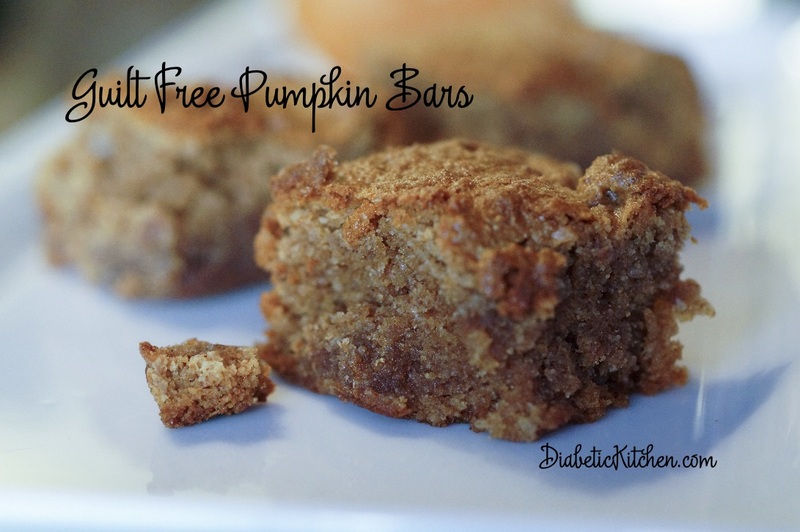 You will love these Pumpkin Bars. When you serve these you are guaranteed oooh’s and ahh’s. 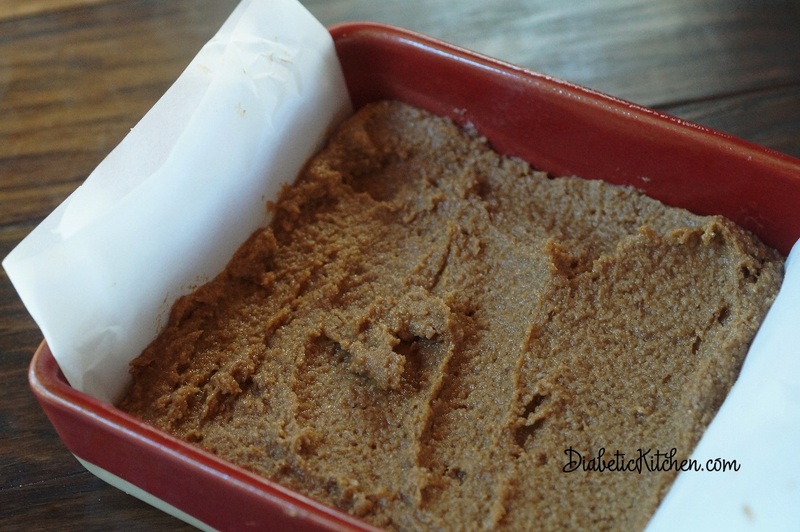 We used our Diabetic Kitchen Nut Butter Cookie Mix as our base. What! Yes, we did. 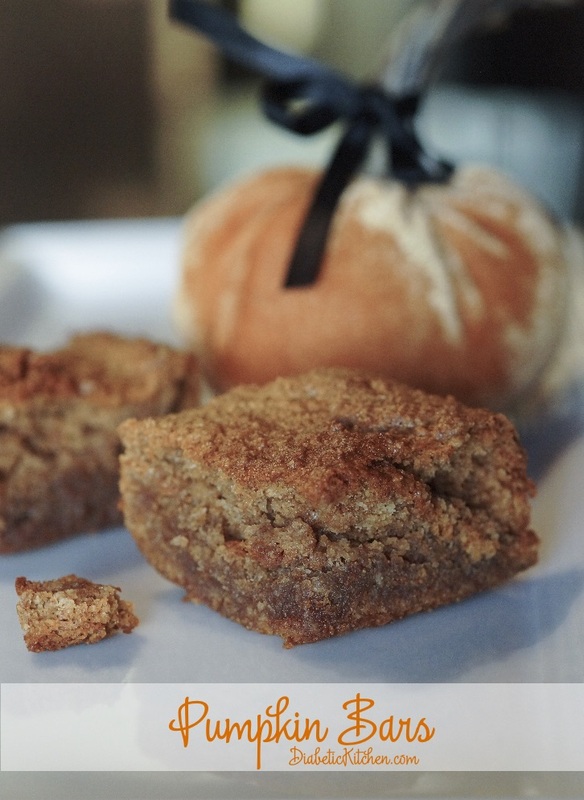 Instead of butter we use Farmers Market Organic Pumpkin and a few other ingredients to create a decadent, chewy, pumpkin treat. 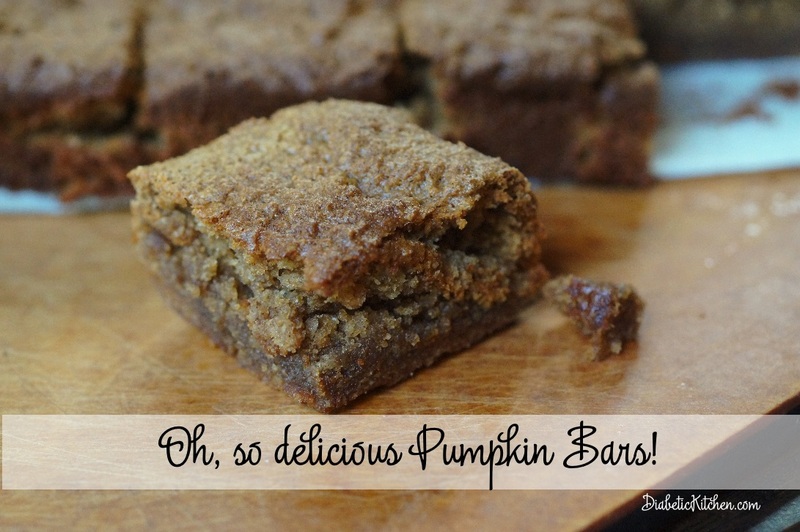 Our official taste testers (aka grandchildren) could not get enough of these pumpkin bars. Well if truth be told neither could their grandfather! 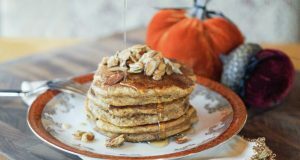 You will use one can of Diabetic Kitchen Nut Butter Cookie Mix with some almond flour, coconut flour, pumpkin, eggs and some pumpkin pie spice. That’s it. No, you don’t use any nut butter even though you are using the Nut Butter Cookie Mix. Prepare your pan just like you do for the Diabetic Kitchen brownie mix. Line it with parchment paper so that you can lift your bars right out of the pan. That makes it very easy to cut with your pizza cutter. This is a thick batter so be sure to spread it to the corners. You will love taking these to a your holiday parties. 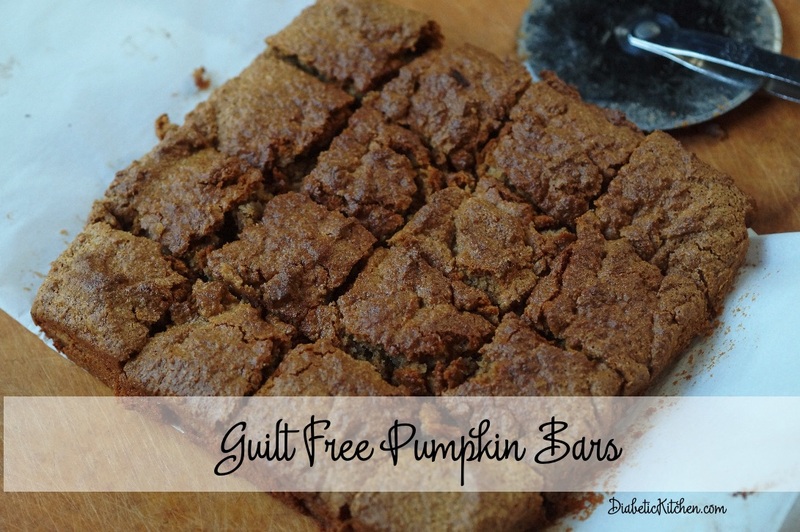 No one will believe that they are guilt free and good for you. You get all the benefits of the Nut Butter Cookie mix in a bar … Gluten Free, high in fiber, no artificial sweeteners, no sugar alcohols, no added sugar, keto friendly. Each bar has 4 net carbs. Line an 8x8-inch glass-baking pan with parchment paper, leaving an overhang on only two opposite sides. Lightly spray with nonstick spray on the 2 sides that will not be covered in parchment paper. In an electric mixer combine all the ingredients in the mixing bowl. Mix on medium speed until combined, scrape sides, then process until smooth. This is a thick batter. Let bars sit in pan for 3-5 minutes. Loosen two sides not with parchment paper overhang, lift from pan and transfer to a wire rack to cool completely before cutting into squares. Use your pizza cutter to cut your perfect Pumpkin Bars. Store on a plate on the counter covered with a CLOTH towel. They will be great for at least 3-4 days stored this way if they last that long. You can move them to the refrigerator at this point for longer storage. Do not store in a plastic container unless you are putting them in the refrigerator. 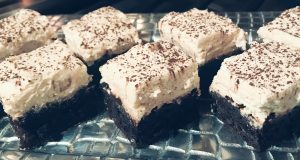 I do make note in the recipe the brands of some products that I used because that is what I use in our kitchen to get the results I am looking for. It doesn’t mean that whatever brand you are using in your kitchen will not work. Next: Make The Most of November- It’s National Diabetes Month! These were very good! It definitely does have a bit of a monk fruit sugar taste still if you eat it by itself, but we had a scoop of low carb ice cream with it and sprinkled a bit of nutmeg on top and it masked that flavor very well. Overall, I would totally make these again. Next time, I will probably make some sugar free whipped cream to go with this, it would probably taste just as good as with the ice cream.